CABO SAN LUCAS, MEXICO--(Marketwire - October 1, 2010) - On December 11, 2010, Capella Pedregal's grounds will be transformed into a distinctive music venue, as Grammy Award-winning artists John Legend and The Roots bring their powerhouse sounds to this intimate, oceanside setting. The exclusive concert will feature selections from Mr. Legend's groundbreaking new album, Wake Up!, in a collaboration with iconic hip hop ensemble The Roots. A portion of the concert proceeds will benefit The Capella Foundation, whose work supports the Los Cabos Children's Foundation, the Gallento Educational Charity and the Los Cabos Humane Charity. The concert kicks off the new and unprecedented Capella Pedregal Concert Series, a succession of live music events at the luxury beachfront resort. John Legend and The Roots, with a special guest appearance by Joss Stone, will perform on a "floating" stage suspended over one of the resort's pools, affording an almost 360 degree view of the band. Guests will enjoy the concert in a relaxed atmosphere with general admission seating that evokes an intimate living room setting with loveseats, chaise lounges and glowing lanterns. Guests of Capella Pedregal can secure a seat through limited packages that include concert tickets along with overnight accommodations at the exclusive hideaway resort. Rates for the three-night package begin at $1,105* per night per guestroom, based on double occupancy. They include two tickets to the performance. During the concert period, Capella Pedregal will also make its expansive, private villa residences available for groups of up to eight people starting at $3,380 per night, including four tickets to the performance. Capella Pedregal's guests and ticket-holders will have an opportunity, as well, to secure unbeatable seats to the show if they book a stay in a Capella Villa, each of which has a terrace overlooking the stage. Capella Pedregal's caring staff will tend to each resort guest by serving canapés and champagne at a pre-concert cocktail party the evening before the performance, followed by a flamenco concert in the resort's open-air lobby. Guests who book this exclusive concert package will also receive daily breakfast for two in the signature Don Manuel's restaurant or in-residence for those who book a Capella Villa; entrée to a private bonfire dinner on Capella Pedregal's private beach as well as a grand finale event featuring a traditional horse dressage show and a 10-piece mariachi band. For those who forego a stay at Pedregal, a limited number of tickets, priced at $500 each, are available for the show alone. A cocktail party upon arrival and a beach party following the show are included in the ticket price. The single tickets may be purchased by calling (877) 247-6688. Partial proceeds from ticket sales will be donated to The Capella Foundation of charities. Official sales begin October 1, 2010 at 12:00pm ET and are available at www.capellapedregal.com and www.johnlegend.com. John Legend is a six-time Grammy winner whose three albums have all hit Number One on the Billboard R&B charts, and who has collaborated with such artists as Kanye West, Jay-Z, Alicia Keys, and the Black Eyed Peas. The Roots -- currently visible nightly as the stupendously versatile house band on "Late Night with Jimmy Fallon" -- have released nine acclaimed studio albums (including the recent "How I Got Over") and redefined the relationship between live instruments and hip-hop. Capella Pedregal occupies one of the most coveted parcels of land in Cabo San Lucas -- 24 beachfront acres at the southernmost tip of Mexico's Baja California Peninsula, near the legendary rock formations known as Land's End. The prized and secluded cliffside setting where the Pacific Ocean meets the Sea of Cortez, reveals an intimate oceanfront hideaway, with just 66 guest accommodations each with plunge pool, affording an unmatched standard of personalized service. Authentic local culture is reflected throughout Capella Pedregal -- from its sophisticated Mexican interiors to tequila tastings and cooking demos in the interactive Cocina. Already heralded by Hollywood's elite as the best new resort in Cabo San Lucas, Mexico, this beachside sanctuary is the perfect location for an intimate concert featuring new music from John Legend and The Roots' new album. 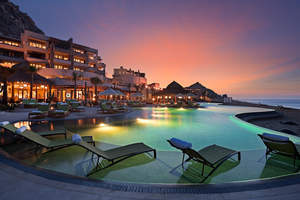 For more information on the concert and resort, call (877) 247-6688 or visit www.capellapedregal.com. R&B singer John Legend has collaborated with The Roots on the groundbreaking album, WAKE UP! The album concept and resulting songs were inspired by the passionate election campaign of 2008, which represented change and hope to so many of America's youth. The 11-song album blends a collection of musical stylings including gospel, rock, funk, and reggae without losing its innate hip-hop feel. The album was released by Sony Music on Sept. 21, 2010 and can be ordered at http://www.johnlegend.com/wakeuppreorder. *Rates are per night for two guests; higher rates apply for each additional guest. Residential packages are available for up to eight (8) guests. A tax of 14 percent and a 15 percent service charge will be added to the guest room bill. All rates are quoted in U.S. dollars.